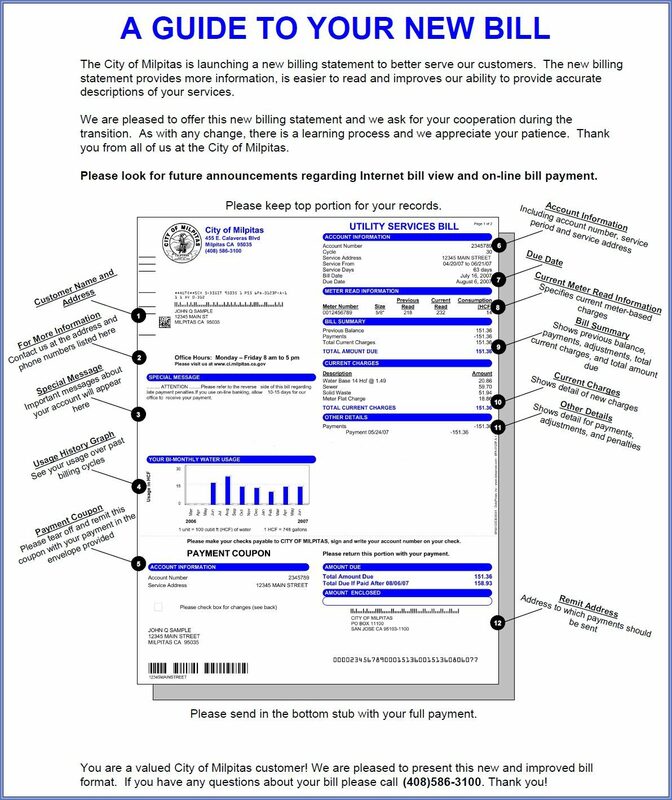 The City of Milpitas Utility Bills have an easy to read format. The City sends out billing statements bi-monthly. Click on the image for a guide to our new bill. Need Help with Public Utilities? If you are having problems with Gas and Electric Service, Water Service, Telephone Service, or Cable TV within the City of Milpitas, please follow this link for more information. The Automatic Payment Service (APS) lets you pay your City of Milpitas Municipal Services bill automatically. Your payment will always be on time, without requiring you to write or mail a check. And it’s absolutely free! After you sign up, you will continue to receive your regular billing statement and you will have plenty of time to contact us with any questions before your automatic payment is made. If you are interested in applying for the program, simply click on the link below and print the form. 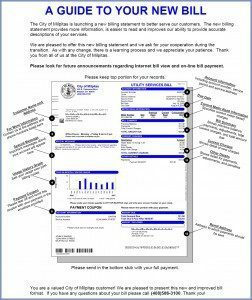 Complete the required information and authorization and mail the form and a voided check to the City of Milpitas at the address indicated on the form. It typically takes from 6 to 8 weeks to process your request. During that time continue to pay your bill as usual until you receive a bill saying “Please do not pay this bill!” As soon as you receive that notification you will know you are on the program. It’s that simple! The Utility Bills On-Line Service allows you to view your City of Milpitas Utility Services Bill online and pay your bill automatically through the Internet by credit card. All you need is your account number and your credit card! The City of Milpitas also lets you pay your City of Milpitas Municipal Services bill automatically by phone using your credit card. All you need is your account number and your credit card! To pay by phone call toll free: (408) 586-3100 and select Option 3.